Sambar may be an important and inevitable dish of a South Indian meal, but the meal is incomplete without hot and tangy rasam. Although sambar and rasam have many common ingredients, they both taste distinct and unique. It is surprising that a simple dish like rasam can overpower a supreme dish such as sambar. It may look and taste simple but making finger-licking rasam that makes you want to sniff your hand much after you have finished your meal and washed your hands is an art to be perfected. Although I have been cooking for many years, I still feel the rasam I make can never match the taste of my mother’s rasam. Thanks to the variety of rasam powders in the market, making good rasam is easy these days. Perfecting the taste is just a matter of time. Rasams are of different types – Tomato Rasam, Garlic Rasam, Pepper rasam, Jeera rasam, and the list is long. My recipe is a combination of some of these. Soak toor dal overnight or 6-8 hours and pressure cook it. You may choose to skip the dal. 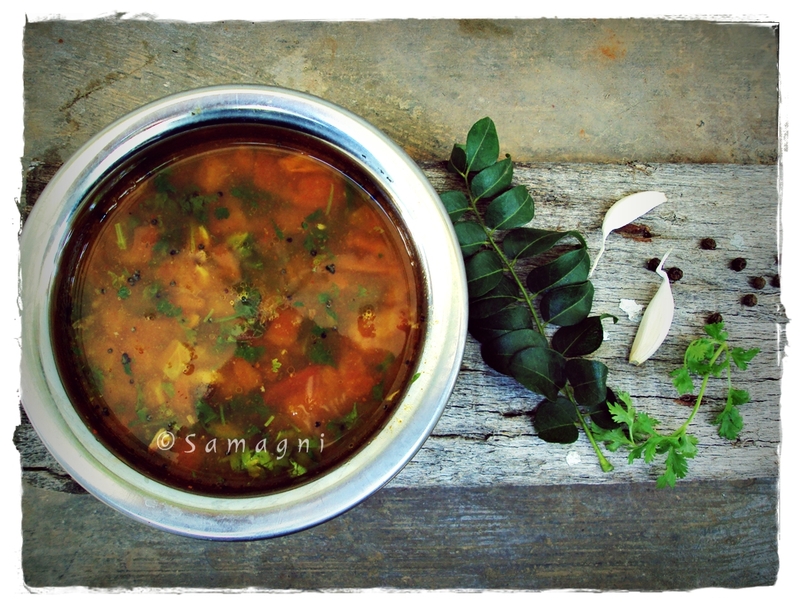 Not adding dal makes the rasam very watery, just like the versions served in weddings. I prefer to add dal because it gives it slight bit of thickness. Soak tamarind in 1 cup of hot water and set aside for 10 mins. In a pot, add 2 cups of water and add chopped tomatoes and turmeric powder. Close and cook for 5-10 mins in medium heat until tomatoes are soft and well cooked. When the tomatoes are cooked well, add salt and tamarind juice. Cook for 2-3 mins. Add the jaggery powder. This helps balance the tanginess of the tamarind without making the rasam sweet. Bring to boil. Mix asafetida powder, pepper powder, chilly powder, and rasam powder in few spoons of water and pour into the cooked tomato. Bring to boil. Do not boil for more than 5 minutes because it can turn rancid and increase acidity in people prone to acidity. Taste and adjust salt, chilly powder/pepper powder if necessary. In a small kadai, heat 1 tsp oil and add mustard seeds. When the mustard seeds start crackling, add crushed garlic and saute. Garlic can be avoided if you do not prefer that flavor. When the garlic turns brown, switch off the fire and add curry leaves. Add this to the rasam. Add finely chopped coriander leaves. If you do not have rasam powder at home, while tempering, after the mustard seeds crackle, you can add a tbsp of coriander powder, chilly powder, crushed jeera, and asafetida. This works as a good substitute for rasam powder. Serve with rice or separately as a soup. I prefer to have rasam with a dollop of ghee mixed in my rice. This makes the rice extremely tasty and cools down your body and heals your throat and stomach. If you are down with a cold, you can spike the pepper in your rasam and drink it as a soup. This helps clear up the throat. My favorite combination is rice, ghee, rasam, and potato poriyal. Yummy! Erissery is a dish that holds an esteemed place in the Kerala sadya. Classic erissery is made with yam and raw banana cooked in a simple gravy of coconut, pepper, and jeera and tempered with roasted coconut. Erissery is a perfect example of the simplicity of traditional Kerala cooking. During summer season, jackfruit and mangoes are abundant in Kerala. Known for resourcefulness, we use all edible parts of a plant/vegetable. After consumption of jackfruit kernels, the seeds are usually saved for later cooking. The seeds are added in avials or used to make mezhukupuratti (stir fry). Here is an erissery made of jackfruit seeds. Pressure cook the jackfruit seeds for up to two whistles. Jackfruit seeds can be cooked normally, but this can be time consuming. Also, jackfruit seeds are more easy to peel after they are cooked. Hence I prefer pressure cooking the jackfruit seeds and then peeling the outer hard white skin. It’s okay to retain the brown layer on the seed. 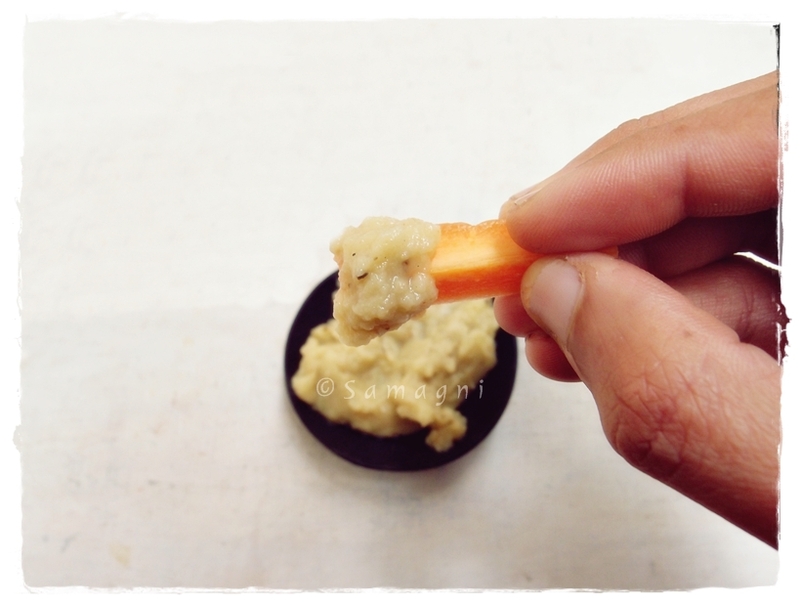 Cut the peeled jackfruit seeds into inch-long pieces (you can choose any other shape as per your preference). Put jackfruit pieces in a pan, add chilly powder, turmeric powder, and salt. Sprinkle little bit of water and let it cook for two minutes. This ensures that salt is spread evenly in all pieces. Meanwhile, grind one cup grated coconut, cumin seeds, and whole black pepper (instead, you could use pepper power) into a smooth paste. Add this to the jackfruit seed pieces. Mix well. Cook for 2-3 minutes and then turn off. Heat a pan and pour oil and add mustard seeds. When the mustard seeds crackle, add curry leaves and half a cup coconut. Fry until the coconut turns golden brown and you start getting the aroma of roasted coconut. Turn off and add to the cooked jackfruit pieces. Mix well. Serve with hot rice.